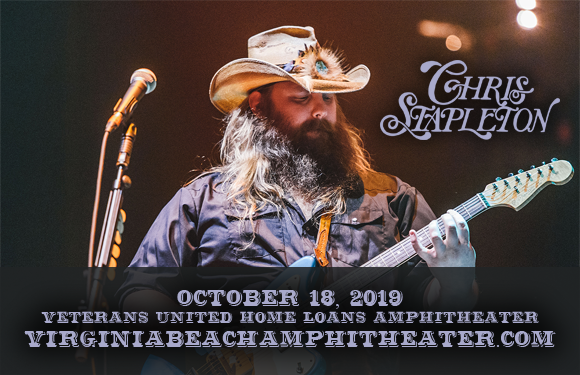 The seemingly unstoppable Chris Stapleton hits the road again this summer on his All-American Roadshow Tour, coming to Veterans United Home Loans Amphitheater on Friday 18th October 2019! The extensive tour, which was launched 2017 and has previously sold out, is hitting over 40 venues across the US this summer! The "Broken Halos" singer will be joined by Brothers Osbourne and Kendall Marvel in support! Making his name as a prodigious professional songwriter, with six number-one songs co-written for other artists under his belt (Kenny Chesney's five-week number-one "Never Wanted Nothing More", George Strait's "Love's Gonna Make It Alright", Luke Bryan's "Drink a Beer" to name a few) and a repertoire of songs that have appeared on the albums of several prominent artists (Adele, Brad Paisley, Dierks Bentley, Vince Gill, Peter Frampton, and Sheryl Crow), it's no wonder Chris Stapleton has been just as successful with his solo career. The American singer-songwriter, guitarist, and record producer was the talk of 2015 with his debut album Traveller, which made the first artist to ever to win Album of the Year, Male Vocalist of the Year and New Artist of the Year at the 2015 Country Music Association Awards, and went on to win two Grammy Awards in 2016. His success continued in 2017 with the release of a double album, From A Room, which came in two volumes; the first of which won him another two Grammy Awards. Both albums debuted at number two on the Billboard 200. Stapleton is the recipient of five Grammy Awards, seven Academy of Country Music Awards, ten Country Music Association Awards, five Billboard Music Awards, two iHeartRadio Music Awards, among others, as well as nine ASCAP Country Awards (including the Vanguard Award) for his work as a composer.